Isn't it lovely how dandelions, the featured herb for April, announce the arrival of spring with their cheery blossoms? Since I caught the foraging bug, springtime cannot come soon enough each year. Which is not to say that I don't thoroughly enjoy winter. 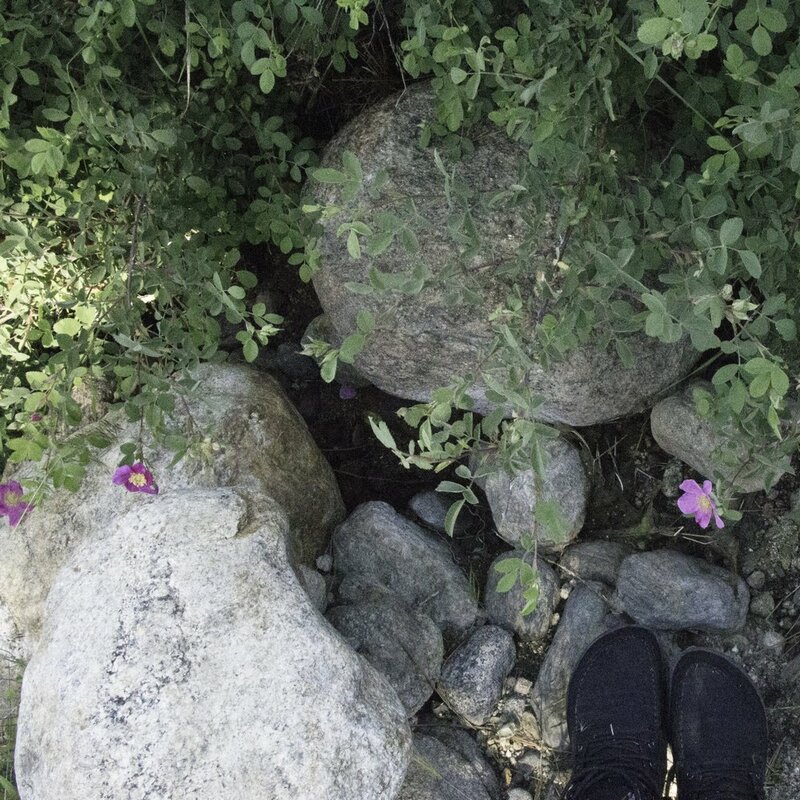 But I do so miss the rush of hunting down, identifying, and picking plants. Who would've thunk that wildcrafting could be so thrilling? This month, we've got all sorts of delightful entries in the Wild Things Round Up - recipes using all parts of the plants, from the roots, to the greens, to the flowers. 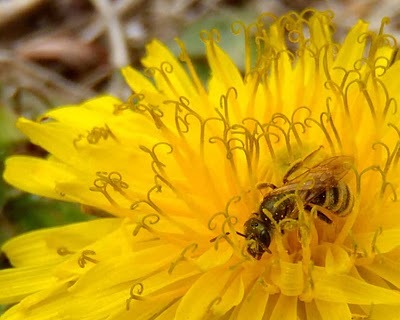 If you'd like to learn more about the many medicinal benefits of dandelion, I really encourage you to go back and read Bek's original post about dandelions. 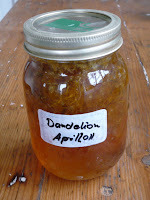 Marcy of the Backyard Patch Herbal Blog, who lives in Illinois is well acquainted with power of the dandelion. She made Sauteed Spicy Dandelion Greens . Also check out this page, where she has a few more recipes (including Dandelion Salad with Fresh Goat Cheese, yum!) and a few of her medicinal dandelion formulations. The Sneaky Magpie, who lives in England made a charming Dandelion Jam, which was inspired by the River Cottage Crew (one of my favorite sources of inspiration as well). This recipe includes directions for making a homemade fruit-based pectin to set the jam. I very badly want a jar of this in my pantry. 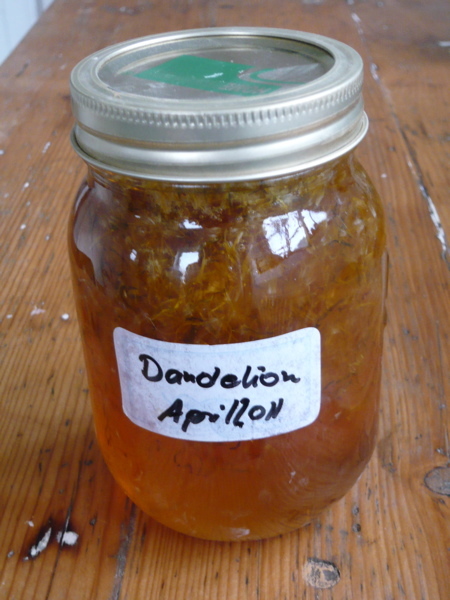 Robin, who has a fantastic foraging blog called Eat Weeds, and also lives in Britain, contributed a recipe for Dandelion Vinegar which is made from both the leaves and roots. 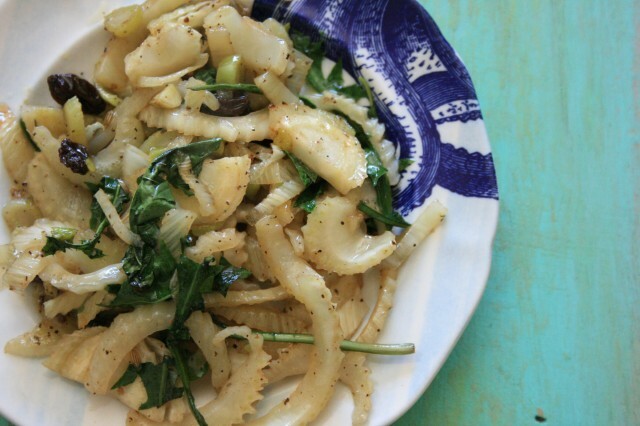 He says that dandelion vinegar is a zesty addition to salad dressings. I think I'd like to try dandelion vinegar as part of a marinade. AnkeB, of the blog Herbology, who lives in Australia came up with a really unique tribute to dandelion greens with her Chicken and Dandelion Soup. It's hearty and rustic, with both meatballs and slices of chicken. This is the kind of dish that would be equally at home served in a fancy restaurant or in a cozy kitchen. The Dyhanaverse is a creative soul after my own heart. She utilized roasted dandelion roots to make this Spring Cake. If your family is gluten-intolerant, you're in luck, as this recipe is gluten-free. Katie had a wild adventure this month. Not only was she lucky enough to harvest dandelions, but she also found morels (who me? jealous? why yes, very much so). She used these choice forages to make a stunning quiche. For those who are still uneasy about eating dandelion greens, I think using them in a quiche is the perfect introduction to their taste. Soak dandelion blossoms and halved morels in saltwater for at least 30 minutes, dandelions no longer than 1 hour. Rinse well, and let dry as much as possible before continuing. Mix eggs, milk, cheese and liquid aminos in a bowl. Pour half of mixture into pie crust (you can make your own or buy one in the frozen foods section). Place tomatoes and morels on top of the mixture, and then lay dandelion blossoms, facing up, on top of the tomatoes and morels. Pour remaining egg mixture over the blossoms. Bake for 30 to 40 minutes @350, or until the top is a nice golden brown. Let cool before cutting. Brooke has a little foraging helper in her family. 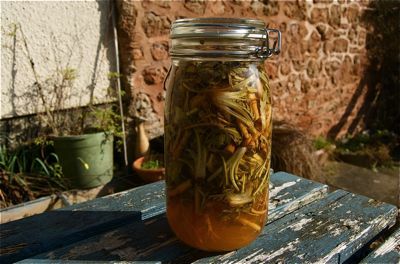 From their harvest came Dandelion Flower Vinegar, which is both delicious and medicinal. "My daughter loves picking dandelion heads and wants to pick some for pancakes. I'll get back to you about that. Anyways, the dandelions all popped today and she couldn't resist picking. So I had a quart of Apple cider vinegar with the mother and lots of dandy flowers." You might have to store a 1/2 cup of apple cider vinegar in another container due to the space that the flowers will take up. Place a dandelion head at the top of the bottle and use a chopstick to push the flower heads into the apple cider vinegar. Let it steep for a couple weeks and use in regular recipes. Its a good way to get some of the benefits of dandelion. Alex, of the blog A Moderate Life, who lives with her family in New York loves Mark Bittman, and also loves her leafy greens. 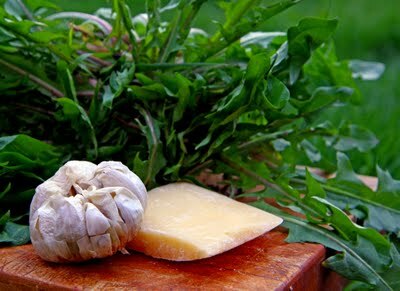 So, it's only natural that she chose to make Dandelion Greens with Double Garlic, one of Bitty's recipes. Herbalist Darcy Blue lives a bit further north than a lot of us, but spring arrived in her neck of the woods just in the nick of time for her to make this fantastic and easyDandelion Walnut Pesto. My co-host Rebecca, of King's Road Apothecary and the blog Cauldrons and Crockpots, who operates out of LA is a genius at knowing how to make a recipe sparkle. 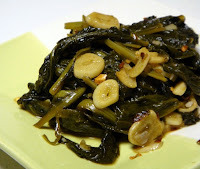 In this case, she added a few raisins to lift up the flavor of her dish, Dandelion and Fennel. Butterpoweredbike (that's me! 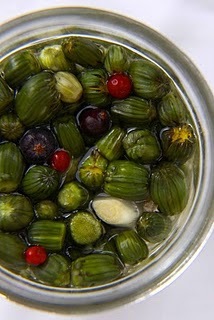 ), a child of the Rocky Mountains, came up with a recipe to use dandelion buds and a little lacto-fermentation magic to create Dandelion Bud Mock Capers. 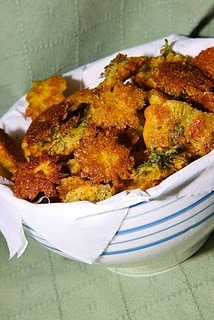 Butterpoweredbike, of the blog Hunger and Thirst, turned dandelion flowers into a crispy crunch yummy with her recipe Batter-Fried Dandelion Flowers. 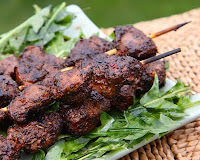 Butterpoweredbike took advantage of the coffee-like taste of roasted dandelion roots to create a Roasted Dandelion Root Rub for Meats, which she used on dove breast. But this versatile rub can be used on any strongly-flavored meat, from beef to game. Butterpoweredbike completed her tour of the dandelion plant by using the leaves to makeDandelion Green Soup with Roasted Garlic and Parmesan. This is a simple, yet boldly flavored soup. Thanks to everyone who was inspired by, and participated in, the Wild Things Round Up. Can't wait to walk on the wild side with you next month!!! !